today i have card number three from my round of papercrafts wcmd swaps hosted by the pc pros--the host, none other than nichole heady; the swap, versatile verses. both of the other swaps featured snowflake serenade by papertrey ink, so i felt compelled to use it again here--duh, she designed it! it's new and has been sitting on my desk *and* the snowflakes are the perfect backdrop for christmas! 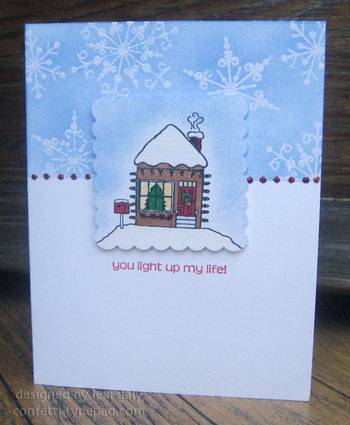 the idea was to create a card with a verse from a favorite holiday song or poem. i love all christmas music, so it was hard to choose, but finally, inspired by the snowflakes, i went with the opening verse from winter wonderland. it pretty much doesn't snow here in new orleans, but we had an actual white christmas a few years ago and it was beautiful and so much fun! 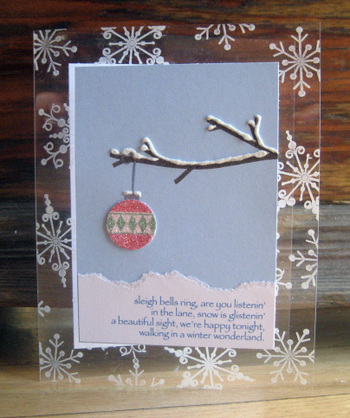 in addition to snowflake serenade, i used take a bough for the branch and ornament. to add snow to my scene i printed the verse on white cardstock, trimmed the bottom and width and tore the top edge, adding stardust stickles along the tear to make it glisten. i also added snow to the branch with liquid applique, dipped into clear glitter while wet, before heating. the ornament is stamped on pink for a bit of extra color and punched with a small circle punch--of course, it needed shimmer too, so i ran it through my xyron sticker maker on the top side and pushed it into the glitter before adhering it to the card. i love sparkle and shine! here is the second of my wcmd swap cards, this time hosted by pc pro alisa. with holiday lights as a theme, i just had to use the holiday house by a muse since it's all lit up! once i decided that, i couldn't get past the one in this post of my a muse guest designer series. so i decided to case myself with some significant changes--i wanted snow gently falling and a soft, mottled night shade of blue, so i masked off the top area of a standard card, stamped and clear embossed the snowflakes (by papertrey ink) and sponged ballet blue ink over them. and since there were 20 cards to make, i traded dots of stickles for the a muse twinkle stickers on the original. finally, i also changed the color of the house a bit as well as the sentiment. one of my favorite touches that you can't see in the picture is that the lights are colored with copic spica markers and they shine like little lights should! on world card making day, the pc pros hosted holiday card swaps as part of the fun events of the day at the paper crafts website and since i was sitting near my computer making cards, i decided to sign up for a few. this one was for pc pro sue's holiday symbol swap. i thought a wreath would be perfect! 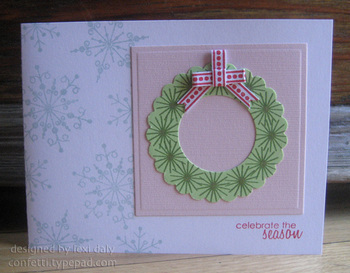 i created this one using a marvy scalloped circle punched around the hole created with a su! circle punch, including the non-traditional combo of pink & blue with red & green. 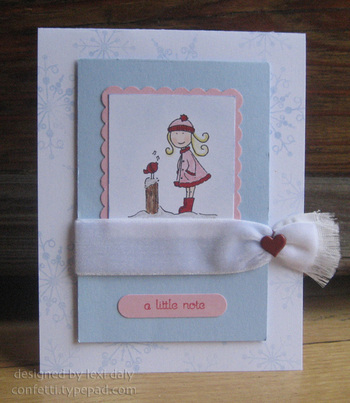 all stamps are papertrey ink (snowflake serenade, butterfly kisses, faux ribbon & take a bough).